Drawing baseball diagrams using ConceptDraw DIAGRAM software extended with the Baseball solution saves your time, and adds more value to your work. You can easily convert vector drawing to a popular graphic format and then post it to your blog or site. There is no problem to add your logo or text copyright, or use some text comments to make your diagrams unique and recognizable. Baseball plays may be hard to explain with a single diagram. In this case you can break your explanation into some stages, and place each stage onto a different page. You don't need to draw from the start point each time, just copy and paste basic drawing to different pages, and then add arrows and text labels in order you talk about them. When you start presenting using F5 button, pages will appear one by one, that allows your audience to understand how players change their positions etc. Sample 1. 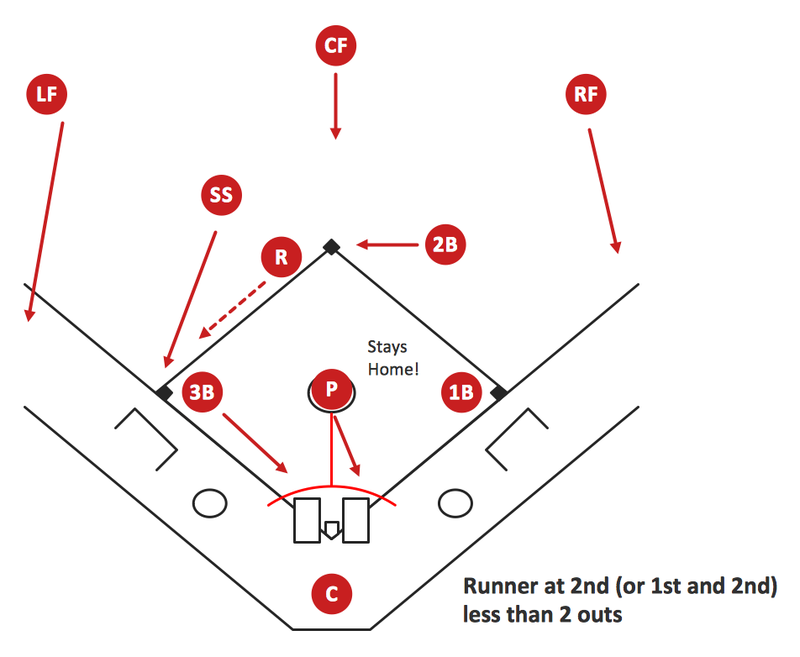 Baseball Diagram – Basic Bunt Coverage – Runner at 2nd. This diagram was created in ConceptDraw DIAGRAM using the "Baseball Positions" library from the Baseball solution. An experienced user spent 10 minutes creating this sample. ConceptDraw DIAGRAM v12 software extended with the Baseball solution delivers libraries, templates and samples allowing baseball fans or specialists to draw baseball-related schemas in minutes. A complete set of predesigned fields and positions make drawing schemas as quickly as possible. It is impossible to imagine mechanical engineering without drawings which represent various mechanical schemes and designs. ConceptDraw DIAGRAM v12 diagramming and vector drawing software supplied with Mechanical Engineering solution from the Engineering area of ConceptDraw Solution Park offers the set of useful tools which make it a powerful Mechanical Drawing Software. Explaining basics of Baseball is practically impossible without drawing a diagram. If you need to do this more than once you have to choose an appropriate tool allows you to change diagrams easily. ConceptDraw DIAGRAM v12 extended with the Baseball Solution is the best choice for this case. Baseball diagram is the simplest way to explain Baseball details. Plenty rules and terms may startle a newbie. Using visual method to explain the meaning of each term, play or strategy gives a clear understanding. ConceptDraw DIAGRAM v12 software extended with the Baseball solution is an amazing tool for producing and presenting baseball diagrams.